The inaugural event for the Reason and Passion group will be a talk by Dr Kerry Spackman about ‘Systems of Morality’. There will be a 20-30 minute talk by Kerry followed by an opportunity for the audience to pose questions. We will then move into something more social so people can get to know each other a bit. Spackman is author of the best selling book ‘The Winner’s Bible’ and was the winner of the 2009 Kea World Class Award for Creative Thinking. In 1992 he received the NEEDA Award for the Most Significant Electronic Export. You can join the group at Meetup.com. 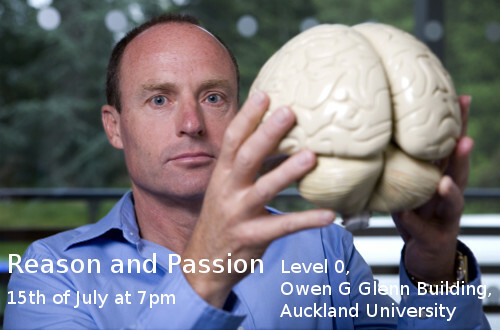 It is being held at the Owen G Glenn Building at Auckland University at 7pm in room B5. Parking is available under the building.